Cement-based three coat stucco systems have been providing a long-lasting, attractive cladding for buildings for over 100 years. These three coat stucco systems have stood the test of time because of their numerous advantages. Three coat stucco is recognized in the IBC/IRC building codes and remains one of the most popular exterior cladding choices for both residential, multi-family, and commercial projects. As its name suggests, three coat stucco is applied in three layers: 3/8-inch thick scratch coat, 3/8-inch thick brown coat, and approximate 1/8-inch thick finish coat. 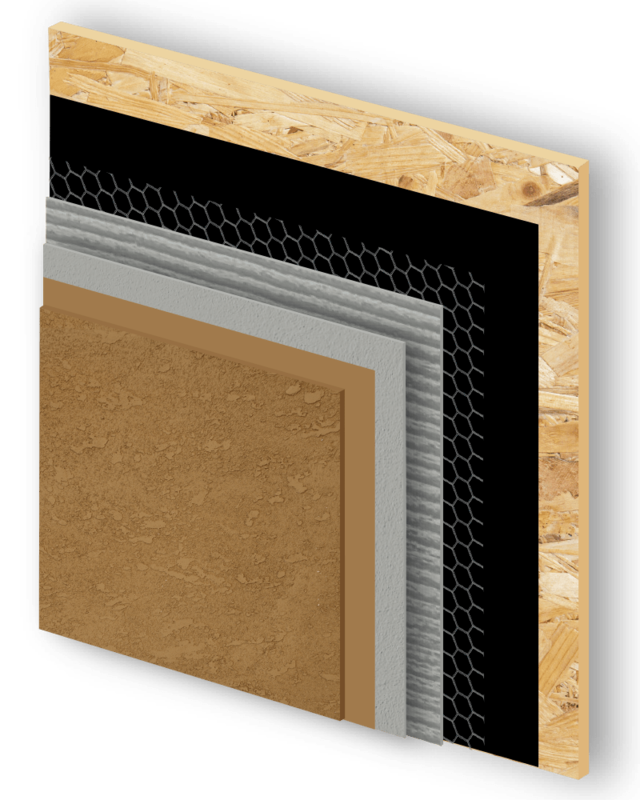 The approximately 7/8-inch three coat system is applied over an approved weather-resistive barrier and metal lath either by hand using a trowel or by machine application. Omega Products also manufactures an array of cement and acrylic-based finish options for three coat stucco including ColorTek exterior grade stucco, OmegaFlex 100% acrylic finishes, and AkroFlex 100% acrylic finishes. Super Cement is a portland cement-based stucco that has an additional mixture of proprietary ingredients that increase the workability and early strength of the product. Super Cement meets the requirements of ASTM C926 and is an excellent alternative to plastic cement or portland cement with lime. Super Cement is available either as fibered or non-fibered. Diamond Wall Three Coat is a factory prepared blend of portland cement, chopped fibers, and proprietary ingredients field mixed with sand, water, and an optional admix. Originally developed for one coat stucco, DWC meets or exceeds three coat stucco requirements and produces a superior wall that can have a finish coat applied in as little as 24-hours after the brown coat.